Our workshop has the latest equipment and expertly-trained staff to handle most types of differentials. We service open, clutch-type limited slip and torsen differentials. So whether your car is front or rear drive, or AWD or 4WD, you can feel confident your vehicle’s differential will receive the problem-specific servicing at Automac. Transmission maintenance and servicing is something that is often overlooked and can lead to an expensive repair, not to mention being stranded and a costly tow. 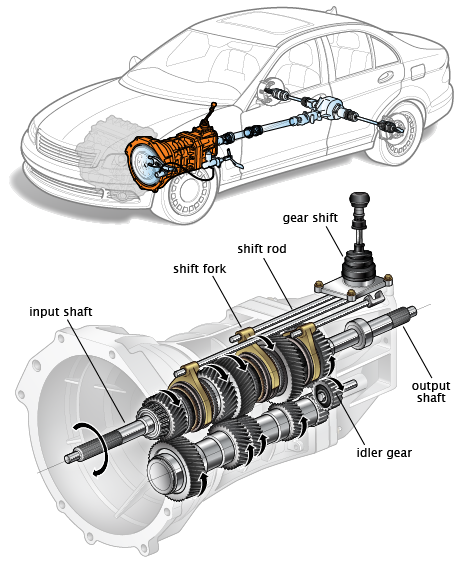 The transmission in your car is what transfers the power from the engine to the wheels. Whilst their automatic counterparts are notorious for problems, manual transmissions and gearboxes are not without their share of faults. Thankfully there are few parts in manual transmissions, making for easier diagnosis and repair. Common tell tale signs of a faulty manual transmission are loud whining or grinding noises while the vehicle is running, difficulty shifting gears or poor handling of the gear shift handle. Our specialist staff can service your manual transmission and manual gearbox. We recommend that you service your transmission every 12 months or 20,000 kms. We provide a number of quality assured services that efficiently inspect the condition of your car’s transmission and gearbox, test the performance and repair and replace parts as needed, ensuring your car’s transmission and gearbox remain trouble free. Our team of technicians are kept up to date with the latest technologies and know how. We provide a number of quality assured services to examine the condition of your car’s transmission and gearbox, test their performance and recommend repair and/or replacement of parts if necessary. The differential is a device that splits the engine torque two ways, allowing each output to spin at a different speed. Differentials coordinate the power to the wheels of your car. Varying amounts of torque are required by each wheel in regular situations such as turning or driving in wet and slippery conditions, as well as in off road conditions. The important thing is that your car’s wheels do not lose traction due to too much force applied from the engine and not enough friction on the road or track you are driving on. Differentials use sets of gears, clutches and fluids to orchestrate the right amount of force to each wheel, minimising the chances of loss of traction and wheel spinning. Keeping your vehicle’s differentials in good condition is important for the safe and smooth performance of your vehicle. Problems with differentials usually occur from wear and tear. Tell-tale signs of poor condition gears, clutches and fluid use in differentials include howling or whining during acceleration, rumbling or rattling, clunking or banging, or consistent vibration that worsens as you accelerate. If you experience any of these noises, bring in your vehicle to Automac and we’ll inspect it for you.